Paid up membership through Oct 1, 2018 required for attendance. Most of the following information is old news, but anything added recently will be highlighted in RED type font. Our reunion will begin with registration on Tuesday, September 26 and officially end following the Banquet Saturday, September 30. 9/26 Tue—Check in -- Hotel 4pm; Hospitality Room, Noon - New name tags will be provided, but please bring old plastic holders. For those members whose renewal date is Oct 1st 2017 should be prepared to renew during the hospitality room check in. 9/27 Wed — Local Day Tour -A bus tour to Daytona Speedway, followed by a stop for lunch at the Racing's North Turn Restaurant and a trip to Light House = $25 per person (museum entrance fees and meals are extra)-- Leaves the Hotel At 9:15 Arrive Ponce inlet lighthouse at 10:00,(price included with tour fee) and departs at Noon, for Restaurant for lunch, Depart at 2, for tour of speedway. Arrive Speedway For 3 PM tour until 4:45. (Speedway tour is an optional full access tour for additional $18.00 P/P Which is a discount). and arrives back at Hotel 6:15. 9/28 Thu — St Augustine Day Tour (We have a bigger bus, so this tour is OPEN again A bus trip to historic St. Augustine -- the oldest city in the U.S. includes on/off city wide shuttle pass and discount coupon book) - 8:15/8:30, departure for Ripley's Red Train tour of St Augustine, 6 Hrs. 10:00, to 4pm. Arrive Back at the hotel at 5:15 to 5:30. Red Train Admission is included in Tour Price: $36 per person. This all-suite hotel has offered us a selection of high quality rooms: "Our guaranteed discounted rates officially expired Sept. 3rd -- but anyone still needing to reserve a room should contact the hotel sales department 386-944-2000, and speak to Jamie for our discounted rate. Each suite has “All the Comforts of Home” with fully equipped kitchens and a separate dining and living area. All rooms offer a pull out sofa bed in the living area. 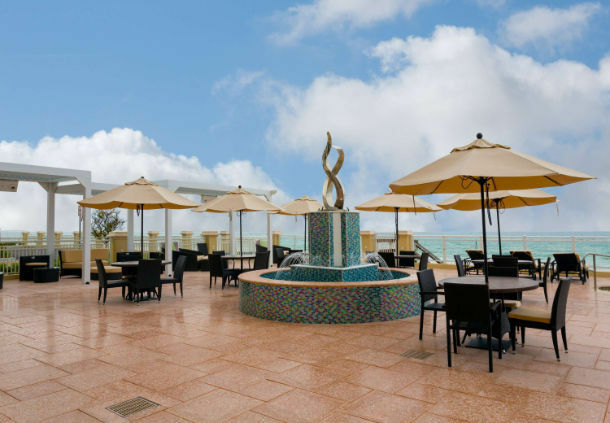 A full service oceanfront bar and grille is open for lunch and dinner featuring specialty appetizers, entrees and desserts. A complimentary full, hot breakfast buffet for each guest is included with each suite reservation along with wireless Internet access in the lobby and guestrooms, onsite parking, 24-hour fitness center and 24-hour business center. The above suite selections are limited so early reservations are recommended by calling the hotel at 386-944-2000 (when connected press 0 (zero), be sure to mention, that you are with the USS Galveston 2017 Reunion. Or you may make a reservation online with this >>>CLICK HERE for <<<< link for online reservation. If calling, be prepared to specify the room/bed type, arrival, and departure dates. Reservations at the group rate will be accommodated up to four days before and/or after the official reunion registration date. A one-night deposit is required on all reservations and will be forfeited if a cancellation is requested later than 48 hours from the arrival date. 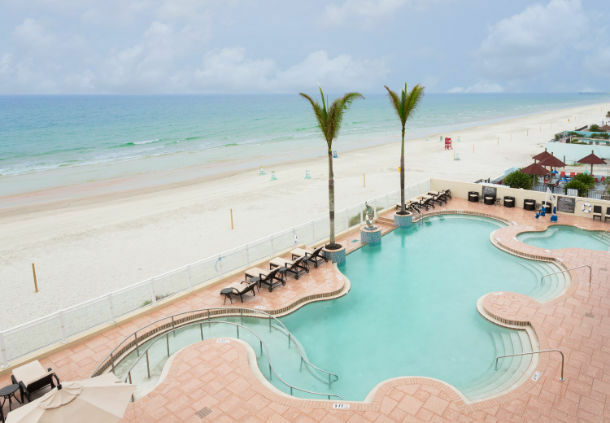 While the hotel does not provide any shuttle service, at just 9.2 miles from Daytona International Airport, reasonable rates for taxi and other private transportation are available. Onsite hotel parking is complimentary. To learn more about our hotel CLICK Here.